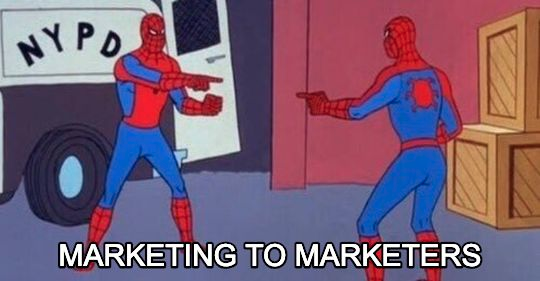 As a marketer, it can be tricky to market to fellow marketers. They likely know all of your tricks and are wise to common techniques. At Hootsuite, we’ve been marketing to marketers—social media marketers, to be precise—for over 10 years. And we’ve learned a thing or two about what works and what doesn’t. Okay, let’s break these down. For us at Hootsuite, that’s LinkedIn. Our audience of social media professionals use the platform to showcase their work and find relevant contacts in the industry. Do a search for “social media managers” on the platform, and you’ll get over 9 million hits. That’s why we share our content and engage with our readers on the platform. Depending on the type of marketer you want to reach, your preferred platform might be Twitter or email. Do smart audience research to determine which platforms and channels your audience is using. When speaking to marketers about marketing as a marketer (or MMM, if you want to help get that acronym trending), you need to use your shared marketing language—or you’ll lose their interest. Get familiar with common industry terminology, whether that’s marketing broadly, or a specific segment like product marketing, for example. This is certainly not a miracle solution, but no one wants to listen to someone who doesn’t sound like they know what they’re talking about. Once you have a better understanding of marketing language, the next step is to get a handle on the tone to use when speaking to other marketers. It’s all in the headline. Cut the fluff and cut to the chase. It builds trust and respect between you and your audience if you treat them as equals when trying to sell them on something. Plus, because many marketers are in the business of creating content, they can be some of the most skeptical consumers of content. You’ll lose them with even the slightest hint of nonsense. That means establishing authenticity through self-awareness and transparency—that’s a key building block in building trust. Your job as a marketer is finding and speaking to the perspective of the people you’re trying to reach. With marketers, if you are one, that shouldn’t be too tricky. You know the pain points of this industry—empathize with your audience over common issues. It’s also important to back all of this up, if possible. Performative transparency is not a good look. Anything from customer reviews, behind-the-scenes insights, and data go a long way. As a marketer, you have to constantly be aware of new trends and strategies to stay ahead of the game. That means you’ve likely been keeping track of what strategies work and where things look to be trending with your own business. Because just like you are, your audience is always on the lookout for new studies, trend reports and white papers. If you can provide the high quality, original content that can help them become better at their jobs, they’ll pay more attention to your company and develop trust in your brand. This is not the easiest suggestion on the list, but if you have the resources it can pay off big time. What can be more effective than that? First of all, what is thought leadership? It stinks of buzzwordy-ness. Thought leadership is a style of content marketing that hinges on the experience, expertise and insights of your business leaders and those coworkers in their orbit. That person will focus on a pressing issue in your industry—usually with a take that is personal, passionate, and answers burning questions on that particular topic. So while it is a bit buzzwordy, if handled correctly, thought leadership can be a highly effective tool. These are exciting ways to establish your brand as an authority on a subject. Plus, they help you become more relatable, turning you into someone social marketers will return to again and again for reliable info. Here are a few examples of our boss following these principles. Thought leadership pieces can also increase brand visibility, generate new leads, and build trust with new and existing customers—an overall a powerful technique for marketing to marketers who want to hear it straight from the boss’ mouth. Reach your target audience on social media with Hootsuite. Schedule and publish posts to all the major networks—and track your performance—from one dashboard. Try it free today. The post 5 Ways Marketers Should Market to Marketers appeared first on Hootsuite Social Media Management.